For the former minor league baseball team, see New Orleans Pelicans (baseball). The Pelicans were established as the New Orleans Hornets in the 2002–03 season when then-owner of the Charlotte Hornets, George Shinn, relocated the franchise to New Orleans. Due to the damage caused by Hurricane Katrina in 2005, the franchise temporarily relocated to Oklahoma City, where they spent two seasons officially known as the New Orleans/Oklahoma City Hornets. The team returned to New Orleans full-time for the 2007–08 season. On January 24, 2013, the franchise announced it would rename itself the Pelicans, effective after the conclusion of the 2012–13 season. The Charlotte Hornets' name, history, and records from 1988 to 2002 were returned to its original city to be used by the then–Charlotte Bobcats franchise, which subsequently became the Charlotte Hornets, starting May 20, 2014. In 16 seasons of play since the original franchise relocated from North Carolina, the Louisiana franchise has achieved an overall regular season record of 610–686, and has qualified for the playoffs seven times. Their achievements include two playoff series victories and one division title. While the Charlotte Hornets put a competitive team on the court throughout the 1990s, the team's attendance began falling dramatically. Many attributed this lapse in popularity to the team's owner, George Shinn, who was slowly becoming despised by the people of the city. In 1997, a Charlotte woman claimed that Shinn had raped her, and the resulting trial severely tarnished his reputation in the city. The consensus was that while Charlotte was as basketball-crazy as ever, fans took out their anger at Shinn on the team. Shinn had also become discontented with the Charlotte Coliseum, which, although considered state-of-the-art when it opened in 1988, had by then been considered obsolete due to a limited number of luxury boxes. On March 26, 2001, both the Hornets and the Vancouver Grizzlies applied for relocation to Memphis, Tennessee, which was ultimately won by the Grizzlies. Shinn issued an ultimatum: unless the city built a new arena at no cost to him, the Hornets would leave town. The city initially refused, leading Shinn to consider moving the team to either Norfolk, Louisville, or St. Louis. Of the cities in the running, only St. Louis had an NBA-ready arena (Savvis Center, now known as the Enterprise Center) already in place and was a larger media market than Charlotte at the time; also, it was the only one of the four to have previously hosted an NBA franchise — the St. Louis Hawks, who moved to Atlanta in 1968. Finally, a new arena in Uptown, which would eventually become the Charlotte Bobcats Arena (now known as Spectrum Center), was included in a non-binding referendum for a larger arts-related package, and Shinn withdrew his application to move the team. Polls showed the referendum on its way to passage. However, just days before the referendum, Mayor Pat McCrory vetoed a living wage ordinance. The veto prompted many of the city's black ministers to oppose the referendum; they felt it was immoral for the city to build a new arena when city employees were not paid enough to make a living. After the referendum failed, city leaders devised a plan to build a new arena in a way that did not require voter support, but made it known that they would not even consider building it unless Shinn sold the team. While even the NBA acknowledged that Shinn had alienated fans, league officials felt such a demand would anger other owners. The city council refused to remove the statement, leading the Hornets to request a move to New Orleans – a move which would eventually return the NBA to that city since the Jazz moved to Salt Lake City in 1979. Before the Hornets were eliminated from the playoffs, the NBA approved the move. As part of a deal, the NBA promised that Charlotte would get a new team, which took the court two years later as the Charlotte Bobcats. In a 2008 interview with the Charlotte Observer, Shinn, who has not returned to Charlotte since the Hornets moved, admitted that the "bad judgment I made in my life" played a role in the Hornets' departure. He also said that if he had it to do all over again, he would not have withdrawn from the public after the sexual assault trial. Shinn emphasized how he was making amends by committing to New Orleans saying, "I've made enough mistakes in my life. I'm not going to make one here. This city needs us here. We're going to make this (New Orleans) thing work." The Hornets opened their inaugural season in New Orleans on October 30, 2002, against New Orleans' original NBA franchise, the now-Utah Jazz. In the first regular season NBA game played in New Orleans in over 17 years, the Hornets defeated the Jazz 100–75, and posthumously retired #7 of "Pistol" Pete Maravich during halftime. The Hornets finished the season with a 47–35 record but were defeated by the Philadelphia 76ers in the First Round of the 2003 playoffs. Following the season, the team unexpectedly fired head coach Paul Silas and replaced him with Tim Floyd. The Hornets began the 2003–04 season strong with a 17–7 start but sputtered at the end and finished 41–41. They lost to the Miami Heat in the First Round of the 2004 playoffs. After the season, Floyd was fired and the team hired Byron Scott as its new head coach. During the first two seasons in New Orleans the Hornets competed in the NBA's Eastern Conference. The 2004–05 season saw the team move to the Western Conference's Southwest Division to even the number of teams in each conference after the Charlotte Bobcats started play in their inaugural season of that same year. In a season marred by injury to the team's three all-stars, the team finished the year with a franchise-worst record of 18–64. In the subsequent draft, the Hornets used their first-round pick to select point guard Chris Paul out of Wake Forest University. Because of the catastrophic devastation brought by Hurricane Katrina upon the communities of southeastern Louisiana, the Hornets franchise temporarily relocated its base of operations to Oklahoma City, Oklahoma, in 2005–06 and 2006–07, posting records of 38–44 and 39–43 respectively. During this time, the franchise was known as the New Orleans/Oklahoma City Hornets. In these two seasons, most home games were played at the Ford Center in Oklahoma City, while a few remained at New Orleans Arena. One year after the Hornets moved back to New Orleans permanently, the Seattle SuperSonics relocated to Oklahoma City and became the Thunder. The Hornets franchise returned to New Orleans full-time for the 2007–08 season, with all 41 home games in the New Orleans Arena. The 2008 NBA All-Star Game and its accompanying festivities were awarded to New Orleans and a serious marketing campaign was commenced in February 2007. Healthier than previous seasons, the Hornets raced to a 29–12 record at the halfway mark, completing the regular season with a record of 56–26, making the season their most successful ever. The Hornets also won their first-ever division title, winning the Southwest Division. Having clinched the 2nd overall seed for the Western Conference in the 2008 playoffs, the Hornets beat the Dallas Mavericks in the First Round, but eventually lost to the defending-champion San Antonio Spurs in seven games in the conference semifinals. In August 2008 the Hornets unveiled a modified logo and new uniforms with the colors of Creole blue, purple, and Mardi Gras gold. Pinstripes were also added to the uniforms. The Hornets also introduced a new gold alternate uniform in 2010 which was used mostly in games played on Saturday at home and on the road. The Hornets finished the 2008–09 season with a 49–33 record. Paired up with the Denver Nuggets in the First Round of the 2009 playoffs, the Hornets were eliminated in five games. The Hornets started the 2009–10 season in a disappointing fashion, and head coach Byron Scott was fired after a 3–6 start to the season. General manager Jeff Bower took over the head coaching duties for the remainder of the season. The Hornets finished the season with a 37–45 record, finishing last in the Southwest division they had won only two seasons before. Jeff Bower later resigned as head coach, and Monty Williams was brought in as new head coach. The team finished the 2010–11 season with a 46–36 record and qualified for the 2011 NBA Playoffs, where they lost to the Lakers 4–2. In December 2010 the NBA purchased the Hornets from George Shinn for an estimated $300 million. 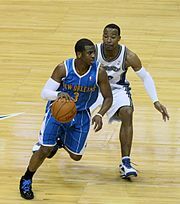 Before the 2011–12 season, the Hornets were considering trade offers for Chris Paul. Paul eventually requested a trade to the New York Knicks. The Hornets looked at many teams, including the Boston Celtics and the Golden State Warriors as trade partners, but Paul had made it clear he wanted to be traded to New York or Los Angeles. A three-team trade involving the Los Angeles Lakers and the Houston Rockets was agreed upon, but commissioner David Stern vetoed the trade. On December 14, 2011, the Hornets agreed to a deal with the Los Angeles Clippers that would send Paul to Los Angeles in exchange for Eric Gordon, Chris Kaman, Al-Farouq Aminu, and a first-round draft pick acquired by the Clippers from a trade with the Minnesota Timberwolves in 2004. At the end of the 66-game lockout-shortened 2011–12 season, the Hornets had the worst record in the West, 21–45. On April 13, 2012, it was announced that Tom Benson, owner of the National Football League's New Orleans Saints, had purchased the franchise from the NBA for $338 million. In addition, Benson announced that he would change the team name to something that would better suit the region, fueling rumors that the Hornets name could one day return to Charlotte, where the Charlotte Bobcats played. In June 2012, Benson appointed two senior Saints executives to supervise the Hornets as well: Saints general manager Mickey Loomis became head of basketball operations, overseeing general manager Dell Demps, and Saints business operations head Dennis Lauscha took on the same role with the Hornets. On May 30, 2012, the Hornets were awarded the first overall pick in the 2012 NBA draft and subsequently drafted Anthony Davis. They also drafted Austin Rivers with the tenth pick (acquired from the Clippers as part of the Chris Paul trade). On July 11, 2012, Ryan Anderson, 2012's Most Improved Player and three-point field goals leader, was acquired by the New Orleans Hornets in a sign-and-trade with the Orlando Magic for Gustavo Ayón. New owner Tom Benson had indicated early in his ownership that he wished to change the team's name to something more local, even preferring that the Utah Jazz – founded in New Orleans in 1974 and played there until 1979 – give up the "Jazz" name, but the Jazz indicated they had no interest in returning the name due to over 30 years of history associated with it. Benson had also heavily favored the names "Brass" and "Krewe". However, on December 4, 2012, it was reported that the Hornets would change their name to the New Orleans Pelicans beginning with the 2013–14 season. The team name is inspired by Louisiana's state bird, the brown pelican. The name "Pelicans" previously had been used by a minor-league baseball team that played in New Orleans from 1901 to 1957. The Hornets organization officially confirmed the name change in a press conference held on January 24, 2013, where officials unveiled the team's new logos and navy blue–gold–red color scheme. On April 18, 2013, after the end of the team's 2012–13 season, the team's name was officially changed to the Pelicans. Following the New Orleans franchise's 2013 disestablishment of the "Hornets" name, on May 21, 2013, the Charlotte Bobcats' owner Michael Jordan officially announced the organization had submitted an application to change the name of his franchise to the Charlotte Hornets for the 2014–15 season pending a majority vote for approval by the NBA Board of Governors at a meeting in Las Vegas, on July 18, 2013. Then-NBA Deputy Commissioner and COO Adam Silver had previously pointed out that the league owns the rights to the name Hornets and that could speed up the process. The NBA unanimously approved the name change starting with 2014–15. On June 27, 2013, during the 2013 NBA draft, the Pelicans selected Nerlens Noel 6th overall, and traded him along with a 2014 protected first-round pick for All-Star point guard Jrue Holiday of the Philadelphia 76ers and the 42nd pick, Pierre Jackson. At a May 20, 2014, press conference announcing the Charlotte Bobcats' official team name change to Hornets, it was also announced that the Pelicans agreed to transfer the records and statistics of the original Hornets (1988–2002) to the current Charlotte franchise, thus unifying all of Charlotte's NBA basketball history under one franchise; the team records and statistics since the 2002 move to New Orleans would be retained by the Pelicans, retroactively turning the Pelicans into a 2002 expansion team. To restate and clarify the series of events: after the 2002 season, the original Hornets moved to New Orleans. In 2004, Charlotte was granted a new franchise, the Bobcats. After the 2013–14 season, the Bobcats changed their name to the Hornets and reclaimed the history and records of the 1988–2002 Hornets. As a result, the Hornets are now reckoned as having suspended operations from 2002 to 2004, while the Pelicans are now reckoned as having joined the league in 2002. For the first time under the name Pelicans, the team qualified for the playoffs with a 45–37 record as the number 8 seed in the Western Conference. They owned the tie-breaker over the Oklahoma City Thunder by winning the regular season head-to-head series, 3–1, and they faced the Golden State Warriors in the First Round; the Warriors swept the Pelicans in four games. After the season, the Pelicans fired coach Monty Williams despite qualifying for the playoffs. 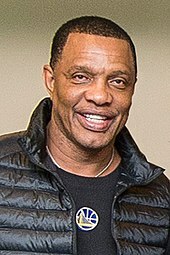 On May 31, 2015, the Pelicans hired Alvin Gentry as the franchise's sixth head coach. On February 20, 2017, the Pelicans acquired DeMarcus Cousins in a trade with the Sacramento Kings when they traded Buddy Hield, Tyreke Evans, Langston Galloway, a 2017 first-round pick, and a 2017 second-round pick in exchange for Cousins and Omri Casspi. On February 1, 2018, the Pelicans acquired Nikola Mirotić in a trade with the Chicago Bulls. Though the trade went through, a previous trade for Mirotić to the Pelicans was called off when New Orleans did not want to pay for Mirotić's 2019 team option contract, that Mirotić signed with the Bulls during the off-season in 2017. The Pelicans received Mirotić and a 2018 second-round pick for veterans Ömer Aşık, Jameer Nelson, and Tony Allen. Mirotić demanded a trade when former teammate Bobby Portis punched Mirotić in the face during an off-season practice. At the time of the trade, Mirotić was the Bulls' leading scorer, and DeMarcus Cousins was injured. Mirotić played well for the Pelicans after the trade, and meshed well with the rest of the team. On March 15, 2018, Tom Benson died from complications of the flu. Ownership of the Pelicans and the Saints were transferred to Benson's widow, Gayle Benson. The Pelicans clinched the playoff spot on April 9, 2018. In the First Round they swept the Portland Trail Blazers 4–0, and then lost to the Golden State Warriors 4–1. In January 2019, Anthony Davis demanded a trade from the franchise, and was fined for publicly announcing the request. The New Orleans Hornets were sold to Tom Benson on April 13, 2012. After purchasing the team, Benson indicated that he wanted to change the club's nickname to something more regionally appropriate. On December 14, 2012, it was reported that the Hornets would change their nickname to the New Orleans Pelicans. On January 24, 2013, the team held a press conference, where it unveiled its new nickname, logos and colors. The name Pelicans is a reference to the brown pelican, the state bird of Louisiana. The team said in a press release that its colors would be navy, gold and red; each color is represented in the city flag of New Orleans. The team formally adopted its new brand identity at the end of the 2012–13 season. On August 1, 2013, the Pelicans released their new uniforms. The 'New Orleans' wordmark logo across the front of the jerseys is inspired by French Quarter street signs; the Pelicans are one of three NBA teams to wear the city name across the front of both home and road jerseys. The partial logo is featured on the sides of the shorts, and the "Bird-de-Lis" logo (a combination mark of the pelican, fleur-de-lis and crescent basketball shape) is featured on the back neck. NBA teams were not allowed to have alternate uniforms during their first season of operation. On September 23, 2014, the Pelicans unveiled a red alternate uniform for the 2014–15 season that would be worn four times in the year. Prior to the red alternate uniform unveiling, the NBA announced that its league logo would be moved to the back neck of game jerseys for all 30 clubs; as a result, the NBA league logo replaced the "Bird-de-Lis" logo on the back neck. On September 17, 2015, the Pelicans unveiled a new alternate uniform, introduced as part of the NBA's "Pride" uniforms for the 2015–16 season. The short-sleeved uniforms feature Mardi Gras' signature colors – purple, green and gold. The tops are purple with green accents on the sleeves and sport 'NOLA' (a local acronym for New Orleans, Louisiana) across the chest in the Pelicans’ signature font in gold letters trimmed in green. The Pelicans 'NO' logo is featured at the bottom of the v-neck and the Crescent City basketball logo is on the left sleeve in Mardi Gras colors. Additionally, the trim around the neckline is purple, green and gold-striped. Additionally, on the back of the jersey, the players’ numbers will be gold with green trim, last name in white traditional lettering and the NBA logo will be featured at the base of the neck. The purple shorts will have green and gold stripes down the side with a small secondary logo – the "Bird-de-Lis" in gold centered on the waistband. The Pelicans’ partial logo is on both sides of the shorts in Mardi Gras colors. The Pelicans hold the draft rights to the following unsigned draft picks who have been playing outside the NBA. A drafted player, either an international draftee or a college draftee who is not signed by the team that drafted him, is allowed to sign with any non-NBA teams. In this case, the team retains the player's draft rights in the NBA until one year after the player's contract with the non-NBA team ends. This list includes draft rights that were acquired from trades with other teams. 1 The then-New Orleans Hornets retired Maravich's number during their first game in New Orleans in honor of his basketball contributions to the state of Louisiana, both during his college career at Louisiana State University (LSU) and his professional career with the city's former NBA team, the New Orleans Jazz. Pierre the Pelican is the official mascot for the Pelicans. He was introduced on October 30, 2013, the opening night of regular season for the team at home against the Indiana Pacers. The name for the mascot was selected by the fans through an online poll on the team's website. However, Pierre's unconventional design frightened some fans. The mascot's redesigned head was released on February 11, 2014. The Pelicans' prior mascot was Hugo the Hornet, who was part of the organization from 2002 to 2013. Hugo returned as the mascot for the Charlotte Hornets starting with the 2014–15 season. ^ a b c "Charlotte Hornets Name Returns to Carolinas". NBA.com/Hornets. NBA Media Ventures, LLC. May 20, 2014. Retrieved September 7, 2015. ^ "NBA.com/Stats–New Orleans Pelicans seasons". National Basketball Association. Retrieved March 19, 2016. ^ "New Orleans Pelicans Logos Unveiled". Pelicans.com. NBA Media Ventures, LLC. January 24, 2013. Retrieved May 15, 2017. ^ "Logos/Marks" (PDF). New Orleans Pelicans 2017-18 Media Guide. NBA Properties, Inc. October 14, 2017. Retrieved December 23, 2017. ^ "New Orleans Pelicans Reproduction Guideline Sheet". NBA Properties, Inc. Retrieved February 27, 2018. ^ "New Orleans Pelicans and Zatarain's cook-up a winning partnership". Pelicans.com (Press release). NBA Media Ventures, LLC. October 25, 2017. Retrieved December 17, 2017. ^ Aldridge, David (March 19, 2018). "Future of New Orleans Pelicans stable, even as team mourns owner Tom Benson's death". NBA.com. NBA Media Ventures, LLC. Retrieved April 5, 2018. ^ "A message from owner Gayle Benson to Pelicans fans". Pelicans.com. NBA Media Ventures, LLC. March 16, 2018. Retrieved April 5, 2018. ^ a b c "Benson Family Unveils New Orleans Pelicans Colors and Logos". New Orleans Pelicans. January 24, 2013. Retrieved January 24, 2013. ^ "CNNSI.com – NBA Basketball – Hornets to apply for relocation to Memphis – Monday March 26, 2001 05:47 PM". SportsIllustrated.CNN.com. March 26, 2001. Archived from the original on February 8, 2002. Retrieved December 7, 2012. ^ "ESPN.com – Council willing to amend 'new owner' statement". ESPN.Go.com. Associated Press. February 16, 2002. Retrieved January 9, 2014. ^ Green, Ron Jr. Shinn: I messed up in Charlotte Archived September 9, 2012, at Archive.today. Charlotte Observer, November 1, 2008. ^ "ESPN.com: Eye for victory". ESPN.Go.com. Retrieved January 9, 2014. ^ "Hornets to Play in Oklahoma City". National Basketball Association. September 21, 2005. Retrieved September 21, 2005. ^ Bennett, Dashiell (January 7, 2011). "Larry Ellison Confirms He Tried To Buy The New Orleans Hornets, But Was Beaten Back By The NBA". Business Insider. Retrieved January 7, 2011. ^ "NBA completes Hornets purchase". National Basketball Association. December 20, 2010. Retrieved December 20, 2010. ^ Beck, Howard (December 8, 2011). "N.B.A. Rejects Trade Sending Paul to Lakers". New York Times. ^ a b "Saints owner Benson buys Hornets from NBA". National Basketball Association. Associated Press. April 13, 2012. Archived from the original on November 17, 2015. Retrieved September 8, 2015. ^ Smith, Jimmy (April 13, 2012). "New Orleans Hornets to be purchased by New Orleans Saints' owner Tom Benson for $338 million". New Orleans Times-Picayune. Retrieved November 1, 2015. ^ "Hornets seeking name change, set to build new practice facility". WWL-TV. April 16, 2012. Archived from the original on January 10, 2014. Retrieved January 9, 2014. ^ "Mickey Loomis takes on top New Orleans Hornets job". NFL.com. Associated Press. June 19, 2012. ^ a b Moore, Matt (June 11, 2008). "Report: Hornets to change name to New Orleans Pelicans in 2013-14". CBSSports.com. Retrieved December 7, 2012. ^ a b "List of Louisiana State symbols". Louisiana Division of Administration. Archived from the original on March 29, 2013. Retrieved January 27, 2013. ^ Eichenhofer, Jim (September 27, 2013). "Pelicans nickname has century-plus history in New Orleans". New Orleans Pelicans. Retrieved September 27, 2013. ^ a b "New Orleans Pelicans Logos Unveiled". New Orleans Pelicans. January 24, 2013. Retrieved January 24, 2013. ^ a b "New Orleans Pelicans Officially Adopt New Namesake". New Orleans Pelicans. April 18, 2013. Retrieved August 10, 2015. ^ "Bobcats Sports & Entertainment Applies to Change Team's Name to Hornets". NBA Media Ventures, LLC. May 21, 2013. Retrieved May 21, 2013. ^ "Jordan: Bobcats changing name to Hornets". NBA Media Ventures, LLC. May 21, 2013. Retrieved May 21, 2013. ^ Keith Pompey; Marc Narducci (October 17, 2013). "Holiday-Noel trade becomes official". The Philadelphia Inquirer. Retrieved September 7, 2015. ^ "New Orleans Pelicans Name Alvin Gentry Head Coach". New Orleans Pelicans. Retrieved May 31, 2015. ^ Wojnarowski, Adrian (February 1, 2018). "Pelicans acquire Nikola Mirotic for three players, first-round pick". ESPN.com. Retrieved August 31, 2018. ^ "Tom Benson's will names Gayle Benson as sole beneficiary, leaves estranged family out". The Times-Picayune. March 17, 2018. Retrieved March 22, 2018. ^ Meagher, Sean (April 10, 2018). "NBA playoff race: Pelicans clinch with win vs Clippers". OregonLive.com. Retrieved April 24, 2018. ^ Amick, Sam (April 21, 2018). "No. 6 seed Pelicans make NBA playoff history with first-round sweep of Trail Blazers". USA TODAY. Retrieved April 24, 2018. ^ Meagher, Sean (May 8, 2018). "Golden State Warriors eliminate New Orleans Pelicans, advance to Western Conference finals". OregonLive.com. Retrieved May 10, 2018. ^ Maloney, Jack (January 29, 2019). "Pelicans' Anthony Davis fined $50,000 for making trade demands public". ESPN.com. Retrieved February 6, 2019. ^ "Pelicans Uniform Unveiling". New Orleans Pelicans. August 1, 2013. Retrieved September 8, 2015. ^ "NEW ORLEANS PELICANS UNVEIL NEW UNIFORMS" (Press release). New Orleans Pelicans. August 1, 2013. Retrieved September 8, 2015. ^ Creamer, Chris (August 1, 2013). "New Orleans Pelicans Unveil New Uniforms". SportsLogos.net. Retrieved August 1, 2013. ^ Lukas, Paul (August 1, 2013). "Uni Watch on Pelicans' jersey reveal". ESPN.com. Retrieved August 4, 2013. ^ "New Orleans Pelicans Unveil Alternate Red Uniform" (Press release). New Orleans Pelicans. September 23, 2014. Retrieved September 23, 2014. ^ "New NBA Swingman Jersey Features – Guide to New 2014–2015 Swingman Jerseys". National Basketball Association. December 19, 2014. Retrieved December 19, 2014. ^ Lukas, Paul (June 19, 2014). "NBA to move league logo to back of jerseys". ESPN.com. Retrieved June 19, 2014. ^ "Pelicans Unveil Pride Uniforms in Celebration of the Spirit of Mardi Gras" (Press release). New Orleans Pelicans. September 17, 2015. Retrieved September 18, 2015. ^ "Pelicans Acquire Ish Smith". NBA.com. February 19, 2015. Retrieved February 19, 2015. ^ "Pierre the Pelican introduced in first quarter". New Orleans Pelicans. October 30, 2013. Retrieved November 7, 2016. ^ Golliver, Ben (October 31, 2013). "New Orleans Pelicans introduce new mascot 'Pierre' as part of rebranding effort". Sports Illustrated. Retrieved January 6, 2013. ^ "PIERRE THE PELICAN INJURY UPDATE" (Press release). New Orleans Pelicans. February 11, 2014. Retrieved November 7, 2016. ^ "A Hornet Comes Home". Charlotte Hornets. June 5, 2014. Retrieved June 5, 2014. Wikimedia Commons has media related to New Orleans Pelicans.